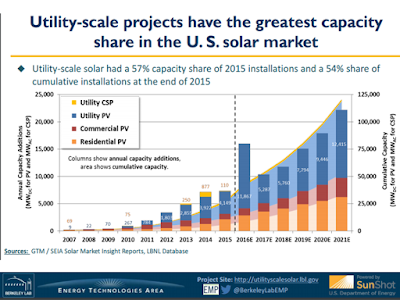 The utility-scale solar sector—defined here to include any ground-mounted photovoltaic (“PV”), concentrating photovoltaic (“CPV”), or concentrating solar power (“CSP”) project that is larger than 5 MWAC in capacity—has led the overall U.S. solar market in terms of installed capacity since 2012. It is expected to maintain its market-leading position for at least another five years, driven in part by December 2015’s three-year extension of the 30% federal investment tax credit (“ITC”) through 2019 (coupled with a favorable switch to a “start construction” rather than a “placed in service” eligibility requirement, and a gradual phase down of the credit to 10% by 2022). In fact, in 2016 alone, the utility-scale sector is projected to install more than twice as much new capacity as it ever has previously in a single year. This unprecedented boom makes it difficult, yet more important than ever, to stay abreast of the latest utility-scale market developments and trends. 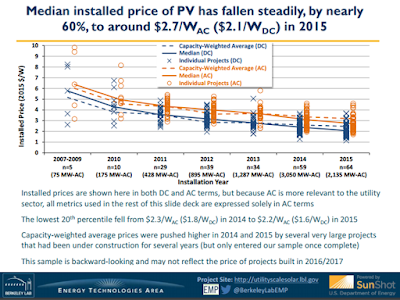 • Installation Trends: Among the total population of utility-scale PV projects from which data samples are drawn, several trends are worth noting due to their influence on (or perhaps reflection of) the cost, performance, and PPA price data analyzed later. For example, the use of solar tracking devices (overwhelmingly single-axis, east-west tracking—though a few dual-axis tracking projects have entered the population in recent years) continued to expand in 2015, particularly among thin-film (CdTe) projects, which had almost exclusively opted for fixed-tilt mounts prior to 2014. In a reflection of the ongoing geographic expansion of the market beyond the high-insolation Southwest, the average long-term insolation level across newly built project sites declined for the first time in 2015. Meanwhile, the average inverter loading ratio—i.e., the ratio of a project’s DC module array nameplate rating to its AC inverter nameplate rating—has increased among more recent project vintages, as oversizing the array can boost generation (relative to the AC capacity), and hence revenue, particularly during the morning and evening shoulder periods. These trends should drive AC capacity factors higher among more recently built PV projects (confirmed by data for projects that were fully operational in 2015). Finally, 2015 saw one new CSP project (a 110 MWAC solar tower project with 10 hours of thermal storage) and one new CPV project (an 18 MWAC project with SunPower’s new C7 technology) achieve commercial operation. 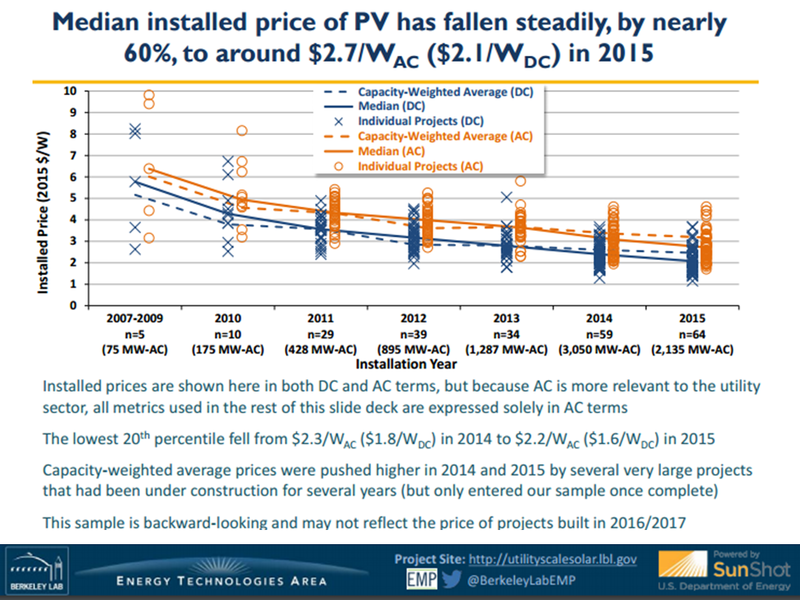 • Installed Prices: Median installed PV project prices within a sizable sample have steadily fallen by nearly 60% since the 2007-2009 period, to $2.7/WAC (or $2.1/WDC) for projects completed in 2015. The lowest 20th percentile of projects within our 2015 sample (of 64 PV projects totaling 2,135 MWAC) were priced at or below $2.2/WAC, with the lowest-priced projects around $1.7/WAC. In comparison (though recognizing technological differences, including 10 hours of thermal storage), the single CSP power tower project that came online in 2015 was priced considerably higher than our PV sample, at $8.9/WAC. • Operation and Maintenance (“O&M”) Costs: What limited empirical O&M cost data are publicly available suggest that PV O&M costs were in the neighborhood of $15/kWAC-year, or $7/MWh, in 2015. These numbers—from an extremely limited sample—include only those costs incurred to directly operate and maintain the generating plant, and should not be confused with total operating expenses, which would also include property taxes, insurance, land royalties, performance bonds, various administrative and other fees, and overhead. • Capacity Factors: The cumulative net AC capacity factors of individual projects in a sample of 170 PV projects totaling 5,907 MWAC range widely, from 15.1% to 35.7%, with a sample mean of 25.7%, a median of 26.4%, and a capacity-weighted average of 27.6%. This project-level variation is based on a number of factors, including the strength of the solar resource at the project site, whether the array is mounted at a fixed tilt or on a tracking mechanism, the inverter loading ratio, the type of modules used (e.g., c-Si versus thin film), and likely degradation. Changes in at least the first three of these factors have driven mean capacity factors higher by project vintage over the last four years, to nearly 27% among 2014-vintage projects (whose first full operating year was in 2015). Turning to other technologies, two of the three CPV projects in our sample seem to be underperforming, relative to both similarly situated PV projects and ex-ante expectations. And the two CSP projects that had struggled to meet performance expectations in 2014 (Solana and Ivanpah) both increased their capacity factors considerably in 2015, though still not quite up to projected long-term, steady-state levels. 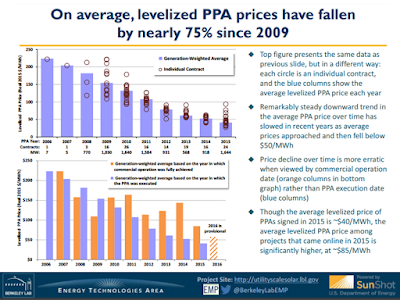 • PPA Prices: Driven by lower installed project prices and improving capacity factors, levelized PPA prices for utility-scale PV have fallen dramatically over time, by $20$30/MWh per year on average from 2006 through 2013, with a smaller price decline of ~$10/MWh per year evident in the 2014 and 2015 samples. 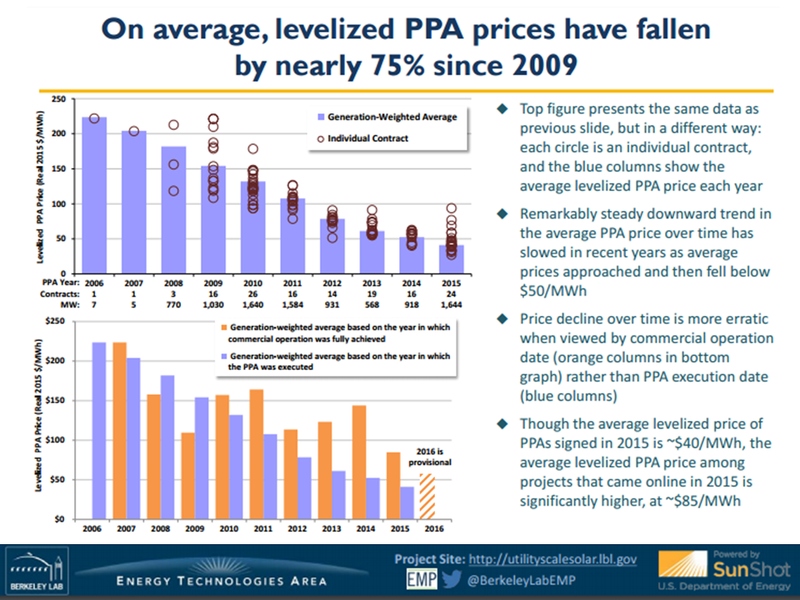 Most PPAs in the 2015 sample—including many outside of California and the Southwest—are priced at or below $50/MWh levelized (in real 2015 dollars), with a few priced as aggressively as ~$30/MWh. Even at these low price levels, PV may still find it difficult to compete with existing gas-fired generation, given how low natural gas prices (and gas price expectations) have fallen over the past year. When stacked up against new gas-fired generation (i.e., including the recovery of up-front capital costs), PV looks more attractive—and in either case can also provide a hedge against possible future increases in fossil fuel costs. Looking ahead, the amount of utility-scale solar capacity in the development pipeline suggests continued momentum and a significant expansion of the industry in future years. At the end of 2015 there was at least 56.8 GW of utility-scale solar power capacity making its way through interconnection queues across the nation (compared to 15.6 GW currently operational). 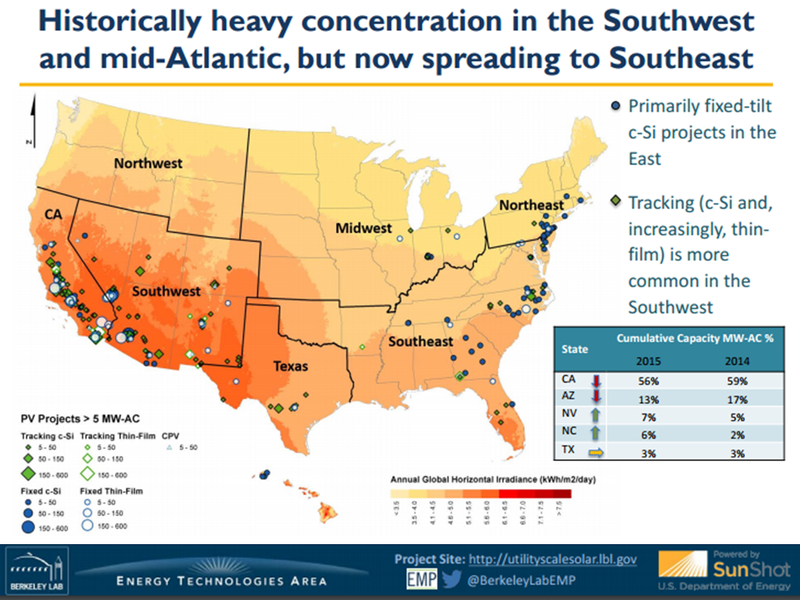 Although most of this planned solar capacity is concentrated in California and the Southwest, the growth within these queues over the past two years—from 39.5 GW at the end of 2013 to 56.8 GW at the end of 2015—has come primarily from the up-and-coming Texas, Southeast, Central, and Northeast regions. Though not all of these projects will ultimately be built, the widening distribution of solar projects within these queues is as clear of a sign as any that the utility-scale market is maturing and expanding outside of its traditional high-insolation comfort zones. Looking ahead, December 2015’s long-term extension of the 30% ITC through 2019 (along with the switch to a “start construction” rather than “placed in service” deadline), with a gradual phase down to 10% thereafter, should ensure continued momentum for the foreseeable future. Data on the amount of utility-scale solar capacity in the development pipeline support this view, and also suggest a significant expansion of the industry—both in terms of volume and geographic distribution—in the coming years. For example, Figure 28 shows the amount of solar power (and, in the inset, other resources) working its way through 35 different interconnection queues administered by independent system operators (“ISOs”), regional transmission organizations (“RTOs”), and utilities across the country as of the end of 2015.56 Although placing a project in the interconnection queue is a necessary step in project development, being in the queue does not guarantee that a project will actually be built57—as a result, these data should be interpreted with caution. That said, efforts have been made by the FERC, ISOs, RTOs, and utilities to reduce the number of speculative projects that have, in previous years, clogged these queues, and despite its inherent imperfections, the amount of solar capacity in the nation’s interconnection queues still provides at least some indication of the amount of planned development. At the end of 2015, there were 56.8 GW of solar power capacity (of any type—e.g., PV, CPV, or CSP) within the interconnection queues reviewed for this report—more than five times the installed utility-scale solar power capacity in our entire project population at that time. These 56.8 GW (23.8 GW of which first entered the queues in 2015) represented 16% of all generating capacity within these selected queues at the time, in third place behind natural gas at 44% and wind at 31% (see Figure 28 inset). The end-of-2015 solar total is also more than 12 GW higher than the 44.6 GW of solar that were in the queues at the end of 2014, suggesting that the solar pipeline has been more than replenished over the past year, despite the record amount of new solar capacity that came online (and therefore exited these queues) in 2015. The larger graph in Figure 28 breaks out the solar capacity by state or region, to provide a sense of where in the United States this pipeline resides. Perhaps not surprisingly (given the map of solar resource and PV project location shown in Figure 3 earlier), 56% of the total solar capacity in the queues at the end of 2015 is within California (42%) and the Southwest region (14%). This combined 56% is down from 60% at the end of 2014 (and 80% at the end of 2013), however, and is yet another indication that the utility-scale solar market is spreading to new states and regions beyond California and the Southwest. For example, Figure 29 shows how the amount of solar in these queues has changed overall and by region over the last three years, from 2013-2015. With the queues in California and the Southwest rather stagnant over this period, the strong growth in the aggregate amount of solar within all queues—from 39.5 GW at the end of 2013 to 56.8 GW at the end of 2015—has come primarily from the up-and-coming Texas, Southeast, Central, and Northeast regions. 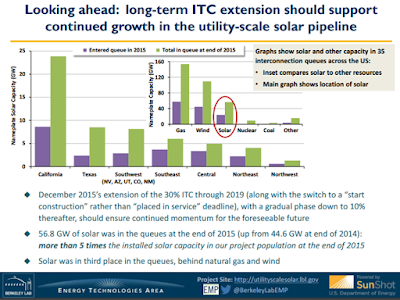 Though not all of the 56.8 GW of planned solar projects represented in Figure 29 will ultimately be built, as shown earlier in Figure 1, analysts expect nearly 12 GW to come online in 2016 alone, with many additional years of strong growth thereafter, driven in part by the long-term extension of the 30% ITC, coupled with utility-scale PV’s declining costs. Of course, accompanying all of this new solar capacity will be substantial amounts of new cost, price, and performance data, which we hope to collect and analyze in future editions of this report.